WASHINGTON (CNS) — During the week following the pan-Orthodox council, which wrapped June 26 in Crete, Greece, Orthodox clergy in the U.S. reflected on what the council would mean for Orthodox Christians here. Going into the council, the most pressing issue for American Orthodox Christians was the question of the diaspora: how the church’s hierarchy should work in lands that are not traditionally Orthodox, but where different groups of Orthodox Christians now live, like in America and Australia. In these places, various Orthodox churches like the Greek, Russian and Ukrainian coexist, meaning that a city like New York can have 10 bishops from five different Orthodox churches. This current organization conflicts with the Orthodox canon, or law, that there should be only one church authority in each region. The final message and encyclical from the Holy and Great Council made no changes to the current structure but affirmed the importance of the governing episcopal assemblies, which bring together the different bishops in these regions. “The council decided to encourage their (the episcopal assemblies’) continuation until the situation in the various regions matured for future development,” said American Greek Orthodox Father John Chryssavgis, who attended the council. The American assembly, called the Assembly of Canonical Orthodox Bishops of the United States of America, is the largest in the world, with almost 60 bishops. “Episcopal assemblies are a first step for sorting out the canonical structure of the Church and bringing about canonical normalcy,” Father Viscuso told Catholic News Service in a phone interview from New Jersey. He said the assemblies are helpful in terms of pooling the Orthodox churches’ resources, and that while they won’t eliminate the priority of ethnic identities in the Orthodox Church, they are a step closer to ensuring the church is one, holy, catholic and apostolic. Father Chryssavgis, also a member of the theological consultation, deemed the meeting a success as it brought the Orthodox churches together to “present a unified, credible witness to their faithful and the rest of the world about their concern for today’s global challenges,” he told CNS in an email. He lauded the civility and honesty of the council’s debates, especially after four of the 14 churches refused to attend. “While there were numerous trials and temptations prior to the opening of the council, on the very first day of its sessions, one could discern the presence and power of the Holy Spirit,” Father Chryssavgis wrote. “Just as on that first day of Pentecost, in the upper room, the disciples of Christ faced their fears and spoke new languages, so too in that room in Crete, high above the Mediterranean Sea, the bishops of the Orthodox Church learned the language of communication and communion. “After years, if not centuries of estrangement and isolation … this was nothing less than a miracle,” he added. Others think the council could have done more. Metropolitan Jonah Paffhausen is the former primate of the Orthodox Church in America — which some churches consider self-governing and others consider part of the Church of Russia — and is now a bishop of the Russian Orthodox Church Outside Russia, which is under Moscow and not self-governing. The Church of Russia did not attend the council in Crete, though it is the most populous Orthodox church. Metropolitan Jonah said of the council’s documents, “I wasn’t impressed. They didn’t really say a whole lot. The council’s final encyclical affirmed church unity, the traditional structure of the family, the importance of morality in education and bioethics, the spiritual and ethical implications of the ecological and migration crises, and the importance of dialogue among Orthodox churches and with the world. Metropolitan Jonah doesn’t see the ethnic divisions in the church as being an issue to resolve — “that’s just how we’re organized” — but wished the council had focused instead on some of the more divisive issues that it ultimately set aside as churches like Russia dropped out in protest. He mentioned in particular the issue of different churches using different calendars. “My hope is that we can come to a more common vision between the various churches so that we can actually deal with some of these issues and come to a common mind,” the metropolitan told CNS in an interview in Alexandria, Virginia. The council’s final encyclical echoed a proposal made in Crete that the bishops should convene more regularly, perhaps every decade, for this type of conciliar dialogue. All three of the clergy members expressed a desire for some sort of unity with Rome. “I think that the ecumenical project with the Roman church is a very good and important thing that we need to pursue,” Metropolitan Jonah said. “We need to pursue that, but on the terms of a unanimity of faith” among the Orthodox churches. The Orthodox Church of America, the Greek Orthodox Archdiocese of America and the Serbian Orthodox Church in the U.S.A. could not be reached for comment at press time. 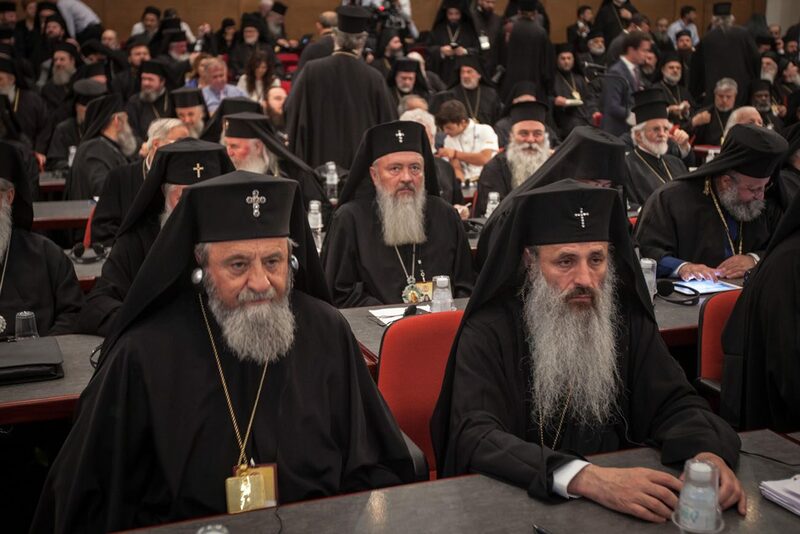 The Antiochian Orthodox Christian Archdiocese, part of the Antiochian Church which did not attend the council, declined to comment as its metropolitan was in Lebanon attending the Antiochian follow-up synod.